What was your thought process in getting Mary to her pink star? That might help understand your playing strategy/style before I suggest you start tossing tokens at Peggy. Mary was the best scout I had at the time prior to new traits and I was pinking one of each class. I don't use scouts much but want to try the high lvl threat reduction scout for challenges. Heck, who doesn’t want a Threat Reduction Scout for high-level Challenges? Go with Peggy. You can get another pink star Scout for double the Threat Reduction fun! As long as Peggy's not Andrea, she's good. But Peggy its a good character keep her and try ruthless trait. In my opinion ruthless are the best trait for scout and shooter. They'll increase more damage when you used you charge ability. But is you're decision. In my personal opinion i would upgrade her the retaliate and ruthless make a scout in a beast. Because you can add her damage with badges. Consider upgrade her and pink as well. And if you want upgrade albert too. I just got exactly same character like Peggy.Dont wanna create new topic.What badges are recommended here? 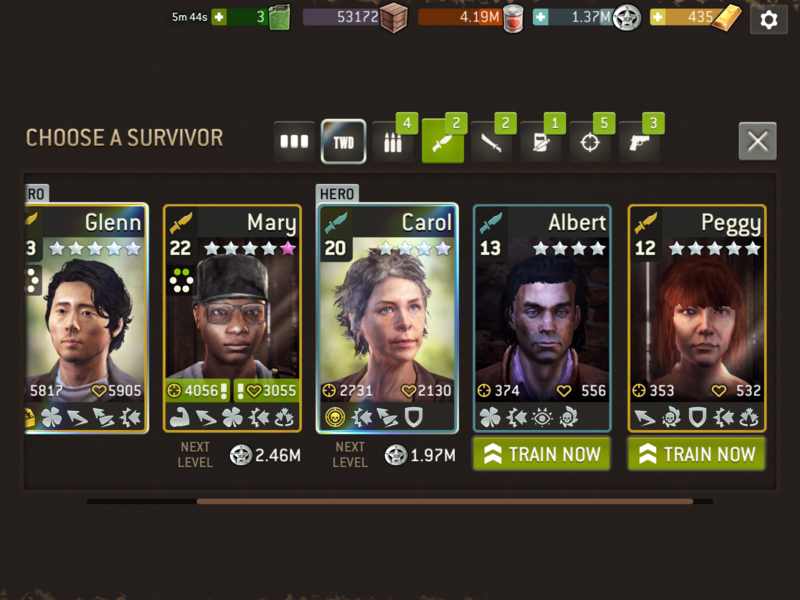 3 - if you stop at survivor lvl +3 or 4 you can use crit chanche too, or for outpost. But utterly useless for high lvl play.